Everyone we know in Jakarta was planning to celebrate the holiday Tuesday and Wednesday of this week. 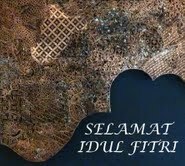 Having wished several people a happy Lebaran yesterday, we discovered from our friend Mark D. at dinner last night that for all members of the largest Islamic group in Indonesia the dates had been shifted to Wednesday/Thursday: a government proclamation was issued Monday afternoon. With newspaper delivery suspended for Tuesday's expected celebrations, we had no idea this had occurred and the staff here at the Ritz-Carlton were too polite to correct us when we greeted them. Indonesia's government has declared that the moon is not in the right position for the Islamic fasting month of Ramadan to end as expected on Tuesday, causing hungry disappointment in the world's largest Muslim-majority nation. Indonesians, 90 percent of whom are Muslim, celebrate the end of Ramadan or Eid al-Fitr festival with a feast and new clothes, but they have been forced to put their delicacies back in the cupboard for one more day. Housewife Nur Arifah did not expect the announcement, which came late on Monday, and got up early that day to cook plenty of stewed beef for her family in Jakarta. "My nephews and nieces have all gathered in my father's house to celebrate with new clothes, yet it's the wrong day. "The market has already shut, so for me to be able to cook a new dish...we might as well eat instant noodles for Eid al-Fitr," she said. Many other Muslims who were set to start eating during the day returned to fasting between sunrise and sunset on Tuesday, while shopping malls pushed their closing holiday to Wednesday. The position of the moon determines the start and end of Ramadan, and astronomers and Muslim bodies told the Indonesian government the moon was too low to herald Eid al-Fitr. But members of Muhammadiyah, the country's second biggest Islamic group, are still celebrating Eid on Tuesday since some astronomers say it falls on that day. Other nations, such as Saudi Arabia, are celebrating as well. Last year the country's highest Islamic authority admitted it had got the direction of Mecca wrong, causing havoc since it meant mosques were all facing in the wrong direction for devotees to pray facing Saudi's holy Islamic city. Since it turned out that everything we had hoped to see on Sunday in Bangka's capital, Pangkalpinang — the tin museum, the shop with "unusual tin gifts" — was closed, our final day might have been a disappointment. Taufiq, however, hired again for the day, made sure this wasn't the case. After breakfast, I first visited the resort gift shop to make what ended up being my sole purchase in Bangka, a kopiah (fez-like Muslim cap) made from bracken fern fibers called resam. We'd seen it the day before but I had balked at the Rp 150,000 price. I had never seen anything like it, though, and when I thought about its being handmade, the $18 price was far from excessive. I hope my using it, inverted, as a basket isn't too irreverent. I may have bought only one lightweight item, but our suitcases were distinctly heavier, thanks to Michael's sand and my beach pebbles. First Taufiq took us through Sangailiat on our way to Matras public beach, known for its white sand. A Dutch house, built over a century ago, on Jalan Parit Padang. 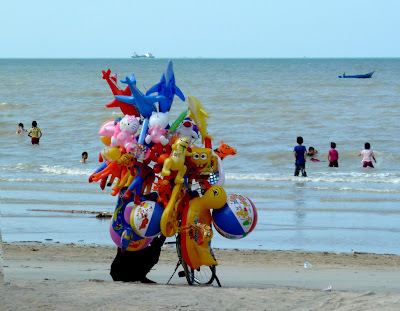 What is this strange man doing on Matras Beach? The best treat of the day: a visit to Taufiq's home, to meet his wife Ida, son Ryan, and newborn daughter Alisa. I admired the baby's scratch-preventive mittens: such a cherished bundle. Other glimpses of Bangka life on our way to Pangkalpinang. These beautifully made baskets were a common feature on the back of motorbikes. One of many female motorbike drivers, helmet over jilbab/hijab. We arrived in Pangkalpinang just in time for lunch. The restaurant, though recommended in the Rough Guide, was nowhere near as good as Raja Laut, in terms of service or food. RM = rumah makan = house of eating = restaurant. Tenggiri (mackerel) again, always a safe bet in Bangka. Cooking took place inside (above), but dishes were washed in the alley outside the restaurant. Another view of washing-up alley. Matras may have the whitest sand of any beach on the island, but Pantai Pasir Padi, which we visited after lunch, is clearly the most popular. Stalls selling corn on the cob punctuated the shoreline with yellow exclamation marks. Serious work was being done, too, but unfortunately there was no catch this day. Nets were empty. Final scenes of Pangkalpinang before Taufiq dropped us off at the airport's El John Executive Lounge — a far cry from Singapore's lounges, especially when the air conditioning stopped working. We wonder if a tin magnate lives here. Stores were closed, but even on a Sunday the open markets were busy. Last sight before airport, Sentosa (quiet, tranquil) cemetery on Jl. Soekarno-Hatta, 27 hectares of "more than 11,478" Chinese graves, according to the May 2010 Garuda in-flight magazine. The oldest dates from about 1915. Ethnic Hakkas (subgroup of Han Chinese) were first brought from Guangdong to work the Bangka tin mines by the sultans of Palembang in the 18th century. The large Chinese population often intermarried with ethnic Malays, and interracial tensions were far less than in pre-1998 Java, where until Reformasi the Chinese were regularly targeted in any civil unrest. When we lived in Jakarta in the 1980s and early 1990s, you couldn't bring into the country any book or other object with Chinese characters.